In the name of head scratchers, Square 1 Financial of Durham, NC, one of the most successful startup banks in a generation, is turning over the keys to PacWest, a California bank. The deal left me scratching my head, because at first glance it made little sense that a bank with Square 1's earnings trajectory would sell. Niche banks are a growing part of our financial institutions landscape. I often cited Square 1 for their focus and success. In their own words, "Square 1 is a financial service company focused primarily on serving entrepreneurs and their investors." A bank with a focused strategy! Brings a tear of joy to my eye. It had one banking office (in Durham), and twelve loan production offices located in key innovation hubs across the US. Its Chairman and CEO, Doug Bowers, was a 30-year BofA vet and more recently a member of a private equity firm. So the niche Square 1 adopted made sense. An industry reporter hypothesized that it was the price... 22x earnings, 262% of tangible book... c'mon?! But that was close to where Square 1 was trading at announcement. So there was no price premium. In fact, the below chart demonstrates that if Square 1 remained independent, their stock price would soar past the value received in this merger. Like most projected performance, the devil's in the details. What I did was assume Square 1's 3-year compound annual growth rate in EPS (86%) linearly came down to earth to 12% by the end of the projection period, which is PacWest's 3-year EPS CAGR. 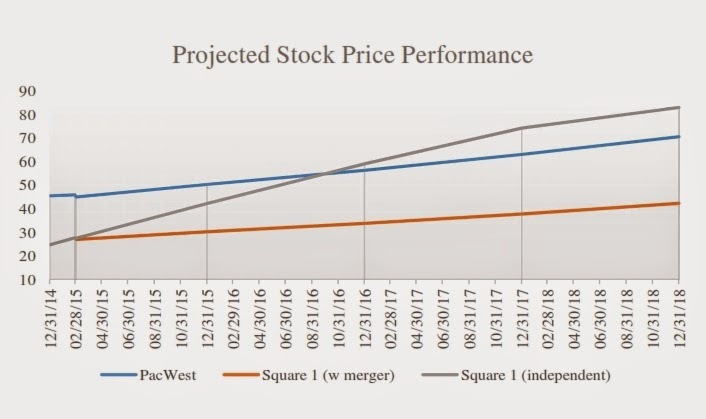 I assumed PacWest's 12% would continue throughout the projection period. If all were true, it would have been more beneficial for Square 1 to go it alone. It is what I term "earning their right to remain independent." So if future valuation wasn't the reason, then why? Perhaps they are receiving an outsized portion of the resulting bank than their current contribution. As I mentioned above, Square 1 did not receive a price premium from PacWest. So their pro forma ownership of PacWest is pretty much in line with their contribution (see table). Usually in a merger the seller receives a larger pro forma ownership stake because they receive a premium on their stock and they are relinquishing control. Not so, in this case. So why did they sell? Here is what Bowers said in the press release: "Joining PacWest will be a terrific opportunity for our clients, employees, and stockholders. Square 1 offers PacWest a complementary line of business and significant core deposit growth. As part of PacWest, we will maintain our steadfast commitment to the entrepreneurial and venture communities, will be able to offer clients a wider array of products and will be well-positioned to continue to serve them through all stages of their growth." 1. Institutional Ownership - Square 1 went public last March, raising $52 million at $18 per share from primarily institutional owners. The company was 70% institutionally owned with such names as Patriot Financial Partners, Castle Creek Capital, Endicott Opportunity Partners and other notables. Some had 5%-10% stakes, or about two million shares. Square 1 traded about 30,000-40,000 shares per day until around February 24th, when volumes soared (a fact that will not be lost on FINRA, although increased volumes prior to a merger announcement are not uncommon due to speculation). With such significant institutional ownership and relatively light normal trading volume, it would have been very difficult for those investors to lock in the trading gains experienced by Square 1 from November-February. How do you lock it in.... sell. Even if you are paid no premium. You can still lock in the price appreciation since you bought into the IPO. 3. Growth Trajectory - Square 1 was trading at 22x earnings when they sold. Banks their size typically trade around 13x-14x earnings. The premium was most likely the result of their balance sheet and earnings growth. Perhaps Doug and his senior management team were staring down the barrel of normalized growth. As investors began to recognize the slower growth, multiples would intuitively come down to the planet earth, suppressing stock price appreciation until the multiple normalized. That could have meant trading in a tight price range for a number of years. Why not lock in your tremendous gain since the IPO, and move on? Square 1 was truly an extraordinary financial institution and I am sorry to see them go because I held them up as a premier example of how focused effort can lead to superior results. If Doug Bowers and team were facing normalized growth and stock price appreciation, they could have decided to "cash cow" the bank, turning over a significant part of their earnings to investors in the form of dividends. In 2014, they enjoyed a 1.25% ROA and a 12.85% ROE. A great candidate for a cash cow. But alas that ship may have sailed when they backed up the truck to the institutional investor loading dock. They were numbers on a spreadsheet and were supposed to deliver the fund managers a big win. What else could Square 1 have done to satisfy their investors? I like this line: "staring down the barrel of normalized earnings." Feel free to use Bonnie! I got a million of 'em. Most would get me in trouble.